I fell in love with J.T. Snow when I started going to Angels games in 1993... that love ended when he hit a home run against the Angels in the 2002 World Series. I love baseball, and I have lots to say about it; from Little Leagues to the Big Leagues and all the leagues in between. I realize I've been quiet, and haven't posted since May 25, despite the Angels having some fantastic wins. My mind has been occupied lately with Little League, and the unfortunate drama involving parent politics that sometimes always goes with it. Our League is no exception, and it seems our League is the winner of "King of all Pre-All Star Drama" in our District. I been quiet because I'm just not sure what to say if anything about it. This year's All Star vote reeked of collusion, kids being threatened with violence if they voted for any one player from one particular team and good ole' boy parent politics. I hate it. It sickens me that 10, 11 and 12 year old kids lose out on the chance to play All Stars because of something so immature. It's corrupt. It's wrong. It's bullying. Someday, I'm going to write a book about all the drama that goes on in Little League. Not now though, and not while I'm a League and District volunteer. I will always do my best." "I will teach all children to play fair and do their best. I will praise a good effort despite the outcome of the game." In case you were wondering, our son did not make All Stars this year. He was disappointed, but we were not all that surprised. Our league has a lot of talented 11 year olds. Was does upset me is that I think some of the reason he wasn't selected by the coaches is in direct relation to who his Father, a manager, and his Grandfather, our League's District Administrator for Little League. Knowing that a coach would ignore a talented player simply to avoid the parents is sad. That didn't just happen to my son, but to two other extreamly talented players who were on the team that won the State Championship last year; and who's parents voiced opinions to the Manager (the same manager this year) about their playing time. In my opinion, a coach has lost all credibility when he tries to manipulate a vote, a team roster or parents to meet his needs and expectations. As opposed to working with the best talent as voted by the players. Again, Kharma will eventually win out. So our Little League season as come to an end, and next year will be my son's last at age 12. It goes so quickly. I am enjoying the Angels winning and home run hitting of late. At least there is some good baseball to watch for a change. It scares me when I'm right! I love seeing Albert Pujols hitting. He's always been a quality player, so I never doubted that he was going to improve. In fact, I like to think that maybe this whole idea of a "slump" was just a conspired joke. A way to get American League pitchers to start pitching to Albert instead of avoiding him. Whatever is happening... I'm glad the Angels are improving. And being the superstitious person that I am... I'm knocking on wood as I type. This weekend, our Travel Ball team, the Tustin Rampage, will be playing in a Memorial Day tournament for USSSA in West Covina. At the end of our winter season in January, the Rampage was ranked #1 in the nation for Travel Ball teams 11U AAA. We fell in rankings because we stopped playing, so we're anxious to get more points. Be safe this weekend, and have fun. Most of all, think about why it is we celebrate Memorial Day. Go Angels! I'm very superstitious. I had a dream the other night that Pujols was hitting again. Like an RBI at every at bat. Home runs more frequently. It was beautiful; and I think it could be happening. But, that is between you and me. Because I'm superstitious. And I really want the Angels to start winning again. Can we take a moment to talk about Little League? A few days ago, I added this photo below to my Baseball Board on Pinterest. 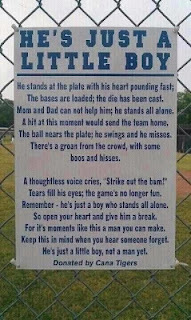 As a volunteer and parent of kids that play in Little League, I feel this advice is essential. I posted a link on Twitter, and a very good friend responded that her daughters weren't signing up for Little League this year because of the "it's all about winning" attitude of their new league. I hate hearing that, because more often than not, Little League stops being fun when parents get too involved. However, being a baseball fan, and very competitive in my own life, there does comes a time when Little League does become all about winning. How else could the Little League organization begin to prepare their players for high school sports and eventually the major leagues? I think it's fair to condone this attitude at the 11-12 year old Majors level, and during All Stars. All Stars should be comprised of the best players from every team. Not for kids who "should get on the All Stars once before they quit" or for kids who's Dads are coaches or on the board of directors, etc. The goal in Little League All Stars is the World Series in Williamsport, Pennsylvania. Winning is everything it takes to get there. And it's not an easy road. The Little League pledge ends with the words "Win or Lose, I will always do my best." The best leagues remember that "kids just want to have fun." Little League has so many wonderful programs; like Challenger, Junior and Senior Leagues for after age 12, and TAD (teaching and development) leagues. In all that Little League does good, I think it's OK to embrace a "win it all" attitude as well when it come to All Stars. I think it becomes emotionally difficult to decide when a young baseball player should quit. If a coach tells you in t-ball that your kid won't cut it - report that coach to the league. He is not doing his job of teaching fundamentals. Similarly, if your child starts to be afraid of the ball, can't hit to save his life, and begins to hate the sport as they near the end at age 12, it might be wise to suggest the find something new. Forcing a child to play baseball because you love the game and you think he's the next Babe Ruth is criminal. Next year is my son's last official year in Little League. He's good ballplayer and is keeping up with his best peers. My husband manages his team, and he's an excellent coach. We are very fortunate in that respect, and I'm grateful that my son truly loves the game. Successful brainwashing I suppose. However, if he were to tell me he didn't want to play anymore, I'd honor his choice at this age. It would rip my heart out, but I'd do it. And, I'd still be just as involved with my volunteer work for Little League, because its not just about my son and his future baseball career. Our Little League season ended last Saturday, and Travel Ball starts up this weekend. Baseball is our life, and we wouldn't have it any other way. Avid Angels Fan and Married Mom to 2. Cancer Survivor since 2009!